Easy mobile printing: Start printing and get connected quickly with easy setup from your smartphone, tablet, or PC. Connect your smartphone or tablet directly to your printer—and easily print without accessing a network. 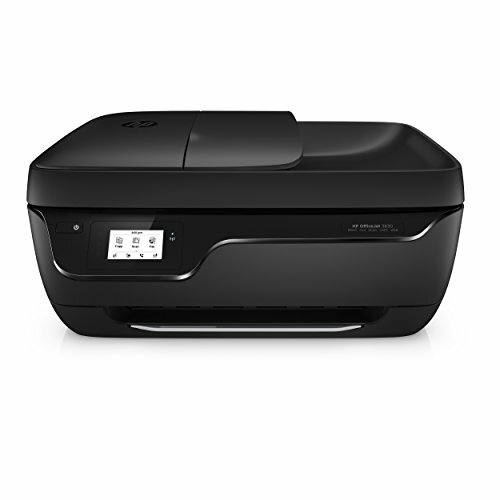 Manage printing tasks and scan on the go with the free HP All-in-One Printer Remote mobile app. Affordable at-home printing: Full of value—print up to twice as many pages with Original HP high-yield ink cartridges. Get high-quality prints—time after time—with an all-in-one designed and built to be reliable. Everything you need—right away: Take charge of your tasks and finish in less time with the easy-to-use 2.2-inch (5.5 cm) display. Quickly copy, scan, and fax multipage documents with the 35-page automatic document feeder. Access coloring pages, recipes, coupons, and more with free HP Printables—delivered on your schedule. Designed to fit your life: Save your space with a compact all-in-one designed to fit on your desk, on a shelf, or anywhere you need it. Print in any room you choose—without causing disruptions. Optional quiet mode helps keep noise to a minimum. Choose an ink replenishment service - Let your printer track usage and have ink delivered before you run out. Either reorder Original HP 63 ink cartridges only when you need them through Amazon Dash Replenishment, or save up to 50% by paying for pages printed through HP Instant Ink. Paper sizes supported: Various sizes from 3x5 in to 8.5x14 in including letter, legal, 4x6 in, 5x7 in, 8x10 in & No. 10 envelopes.